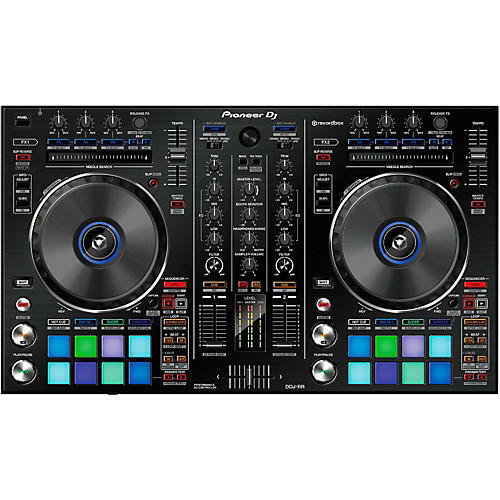 The DDJ-RR is the little brother of Pioneer's professional controllers for rekordbox dj, the DDJ-RZ and DDJ-RX. It has a compact design and intuitive layout with large jog wheels, illuminated on-jog indicators and tactile Performance Pads. This 2-channel controller comes with dedicated controls for rekordbox dj, such as Slip Mode, Release FX, Sequence Load, and Deck Select so you can switch between all 4 rekordbox dj decks by the touch of a button. You get a free rekordbox dj licence key bundled with this controller. Simply activate your license key, connect the controller and start DJing. Large jog wheels with an illuminated On-Jog Display provide responsive scratching, and let you know the status of each deck at a glance. Plus the DDJ-RR has a durable, brushed aluminum top plate just like our flagship controllers and NXS2 set-up. Set colors for your Hot Cues in rekordbox then trigger with high quality rubber pads. Or use the Performance Pads to bring Pad FX, Beat Jump and Slicer into the mix.